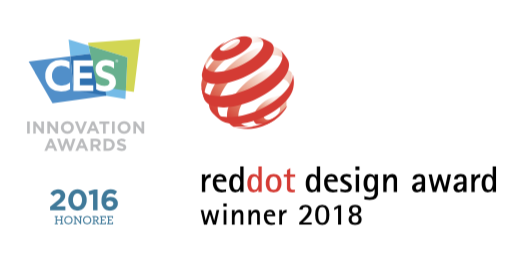 Joan from Visionect is an award-winning digital display and room management solution for easy scheduling of office spaces and meeting rooms. Built on revolutionary low-power e-paper technology, the device seamlessly connects to existing calendars and infrastructure, has no buttons, and is ready to install in just minutes. 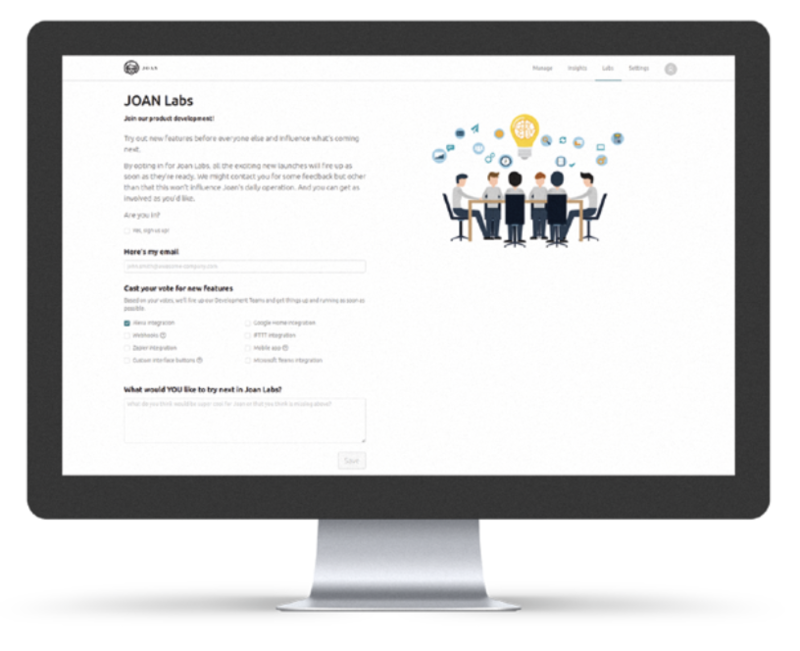 Joan is completely customizable and can be accessed from a mobile app, Slack, Cisco Webex Teams, or directly at the meeting room door. 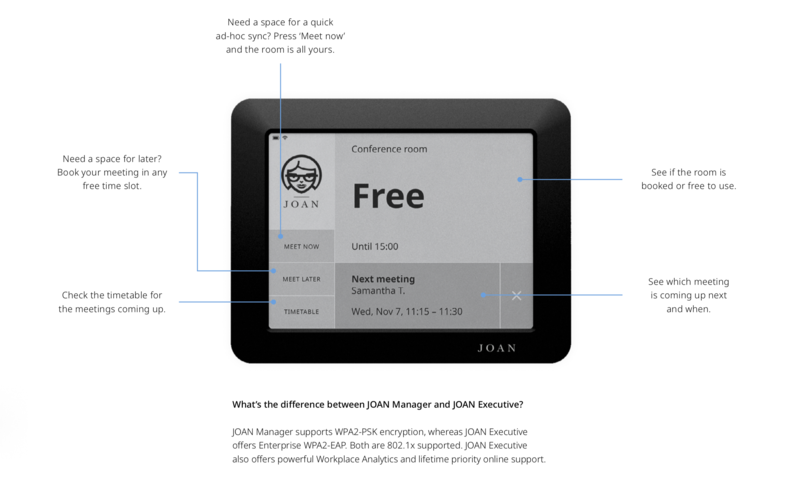 JOAN products for your meeting room reservations. Clear up meeting room confusion. Straight away. Organize and reserve meeting room space with simple, easy-to-use devices that show meeting information, the meetings coming up and eliminate meeting interruptions by clearly signaling if the room is occupied and until when. JOAN is a cost-effective meeting room solution that helps modern, busy workplaces be more productive. Its extreme battery life, simple installation with zero costs coupled with the quiet elegance of electronic paper earned it the Red Dot and CES Innovation awards and made it into the market disrupter it is today. Room availability. At a glance. Whenever you need. Wherever you are. Real-time. Display room status and bring transparency to the way your room resources. Eliminate meeting room conflict, double bookings, interruptions and meeting no-shows. Don’t lose another minute hunting for a room. Prevent meeting room theft, squatters taking over or meeting overruns. Reserve meeting rooms on the go and walk right in or book for later. Or just glance the display for the information you need. JOAN Manager & JOAN Executive. Display room status and book your meetings on the JOAN display by pressing “Meet now” or schedule a meeting in your calendar and add a room. The room is reserved, the meeting will show up in your calendar and you can just walk right in. With up to 12 weeks of battery life for JOAN Manager and JOAN Executive and up to 12 months for JOAN Board, you can simply forget about charging and focus on your work. Your meeting rooms on one screen. At a glance. An overview of room availability for up to 9 rooms of your choice. Place it in the reception area, lobby, lounge or shared space. Perfect for employees on the go when not at the meeting room door. And for your visitors when they arrive at your office for their meeting. Simple wayfinding and a great welcome. JOAN Board was developed on the breakthrough Place & Play signage concept, the result of a decade of market-leading expertise. It is an all-in-one technology unparalleled in versatility, ultra-low energy consumption, ease of installation and simplicity of use. 99% more power efficient than LCD or LED, with up to 12months of battery autonomy and no wires, Place & Play is leading the global revolution with greener and better displays. JOAN products are made to work together. Place the bigger JOAN Boards into your reception area or frequented areas so people have the information they need as they walk through the door, and fix the smaller JOAN Managers or JOAN Executives onto your meeting room doors to give them the option of booking on the spot as well as through the company calendar. Manage all JOAN devices from one place. Easy to use and secure. All contents copyright © 2018 - 2019 MobileSurety Corporation. All rights reserved.